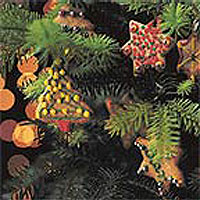 Make edible Christmas decorations by cutting the spicy, shortbread-like dough into tree, star or bell shapes. Let the children run wild with their imagination: they can use icing pens, sugar baubles and silver balls, all available from Waitrose. Sift the flour and spices into a mixing bowl. Add the diced butter and rub into the flour mixture using your fingertips, until the mixture resembles fine breadcrumbs. Add the honey and mix gently together to make a soft dough. (The dough can also be made in a food processor.) Wrap in clingfilm or greaseproof paper and chill for about 30 minutes, or until firm. Preheat the oven to 180°C, gas mark 4. Grease 2 baking trays. Lightly flour the work surface and a rolling pin, then roll out the dough to 3-6mm thick. Cut out shapes using biscuit cutters or by cutting around a cardboard template. Using a cocktail stick, make a hole at the top of each shape large enough to thread through a ribbon. Place the biscuits slightly apart on the prepared trays and chill for 10 minutes. Bake for about 10 minutes, or until golden. Leave on the trays to cool for 5 minutes, then transfer to wire cooling racks. When cold, decorate with the icing pens - pipe a name or message or wavy patterns - then finish with tiny silver balls pressed into the icing. Leave until set, then thread ribbons through the holes for hanging on the tree. Please note: honey spice cookies that have been hanging on the tree should be eaten within a week.